The quiet town of Deerfield, Massachusetts is known for many things: the so-called Bloody Brook Massacre of 1675, the restored museum homes of Old Deerfield, Deerfield Academy, and of course, that candle-lovers’ mecca, Yankee Candle. But scientific research? If you drive along the banks of the Connecticut River in South Deerfield, behind a long fence, acres of farmland with beautifully fertile soil are home to, yes, scientific research. This is a particular kind of research because it’s applied research. That is, research with practical application in the real world. In this case the real world is the world of farming in New England and lucky New Englanders get to enjoy the bounties of this research every summer and fall in the form of fresh, locally-grown vegetables and crops. This is UMass Amherst’s Crop and Animal Research and Education Farm, a beautiful 350 acres tucked between Mount Sugarloaf on the north and River Road (and the Connecticut River!) on the south. Many things happen on this farm—it’s a busy place for students, professors, farmers, extension educators and others—but 60 acres of the farm is set aside for research every year and is divided into 34 research plots. Read on to explore the research and the researchers who worked on a few of those plots this past year. This is research that really matters to the agriculture of the region. Research Plot 24: Can interplanting legumes with vegetables reduce the cost of buying and applying nitrogen? Nitrogen can be a challenge for farmers. Appropriate levels in the soil are a must to grow healthy plants, but it is expensive and time-consuming to amend the soil by adding nitrogen in a liquid, granular or powder form. Researchers hope that use of proper rotation and/or interplanting crops with legumes can significantly reduce or even eliminate the cost of purchasing and applying nitrogen. Each week last summer, graduate student Alexa Smychkovich, part of Extension Professor Masoud Hashemi’s team examining nitrogen accumulation in faba bean, harvested kohlrabi that had been interplanted with decomposing faba bean plants. Since faba beans are rich in nitrogen, they can add precious nitrogen to the soil as they decay. Smychkovich hauled kohlrabi plants to the laboratory to see how much nitrogen had been taken up by the growing plant and also quantified the contribution of faba bean to the nitrogen needs of kohlrabi. Relatedly, but on a different plot, researchers add liquid or powdered nitrogen to the soil at five different rates to determine effectiveness of added nitrogen and compare it to interplanting methods to gauge the most effective methods. Hashemi works with growers to share his research results in the hopes that the most effective and economical solutions will assist them. Research Plot 4: If the best barley means the best beer, how do you grow the best barley? 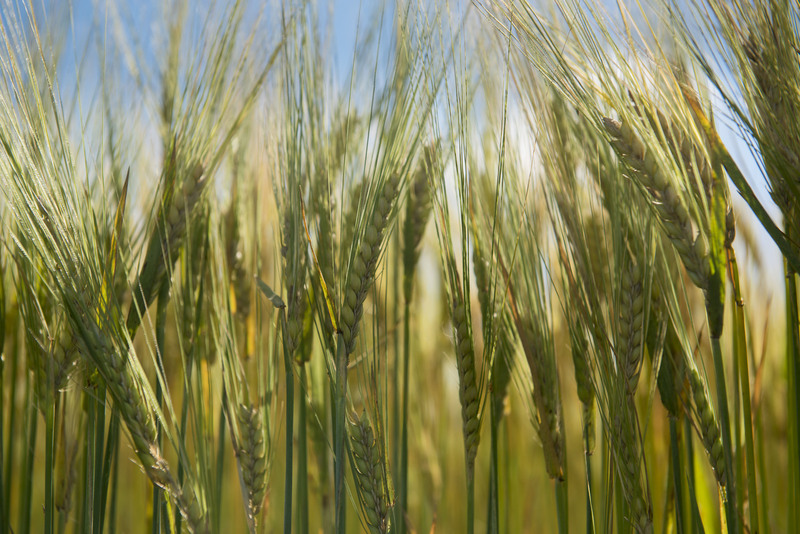 In the last seven years, many New England farmers have added barley to their cropping system to meet emerging demands of new craft beer brewers. Professor Hashemi, of the Stockbridge School of Agriculture, grows and researches both spring and winter barley, testing various genotypes. He is searching for ones that combine highest grain yield with 15 quality criteria that will determine the acceptability of the barley by the ‘maltsters.’ Harvested seeds are tested and ranked based on their yield and quality criteria. The higher the number of desirable traits, the greater the chance that they will become premium seeds, fetching up to 75 cents per pound. To get this information into the hands of growers and malt brewers, Hashemi organizes field day events and shares information through newsletters on his website. Research Plot 5: Keeping those cukes coming! UMass Extension vegetable specialist Sue Scheufele spent the growing season looking for new, more ecologically-based methods growers can use to manage insect and disease pests of vegetable crops. As she walks through a field of cucumbers, Sue examines leaves from eight different varieties, looking for signs of downy mildew—a damaging disease that causes plants to die rapidly, cutting the cucumber season short by several weeks or even months. Scheufele has found that while many varieties are very susceptible to this disease, some newer varieties have been bred to have strong resistance and the plants survive and produce more cucumbers, later into the fall. Sue has been studying downy mildew resistance in cucumbers for several years now, with grant funding from the Mass. Department of Agricultural Resources and the New England Vegetable and Berry Grower’s Association, as well as support from Johnny’s Selected Seeds in Maine. Over the years, Sue has identified several new varieties with strong downy mildew resistance, including slicers, picklers, and even the long, skinny Asian types. In another part of the research area, butternut squash vines stretch as far as the eye can see. 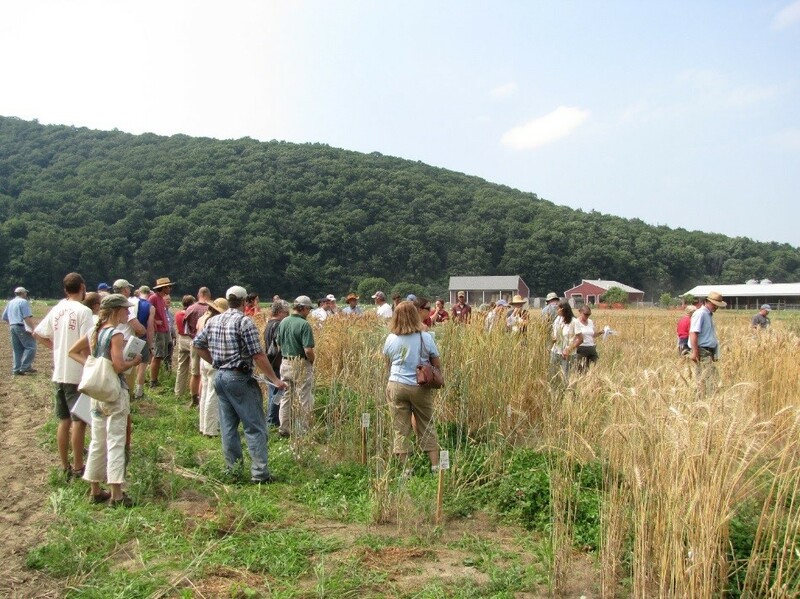 This large-scale project is Scheufele’s part of a regional collaboration with colleagues in Maryland, Virginia, Pennsylvania, New Jersey and New York under a grant from the National Institute of Food and Agriculture at USDA. The goals of the project are to find new ways to control diseases that plague butternut squash and other cucurbit crops, ways that are less harmful to honeybees than current methods. Diseases such as downy and powdery mildews are widespread across the country and are usually controlled by fungicides, especially those with the active ingredient chlorothalonil. In recent years, we have learned that, while this fungicide is not directly toxic to bees, it knocks out a beneficial microbe present in the honeybees’ guts, and makes them more susceptible to the parasite Nosema. Therefore, it is a contributor to declining honeybee health. The goal of the current experiment is to find alternative spray programs that use little or no chlorothalonil, and also identify varieties with resistance to disease to further reduce the need for fungicides. In another field, flowers bloom in tidy squares. 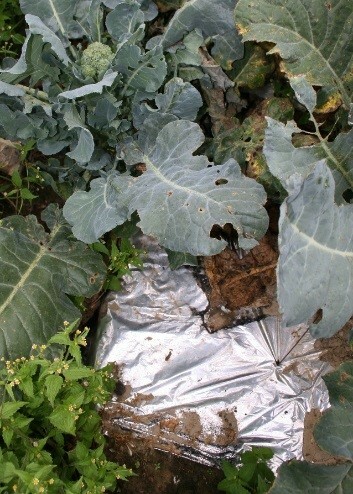 This field study is part of a grant-funded collaboration with researchers in New York, New Hampshire and Connecticut on ecological management of insect pests of brassica plants, in this case broccoli and Brussels sprouts. 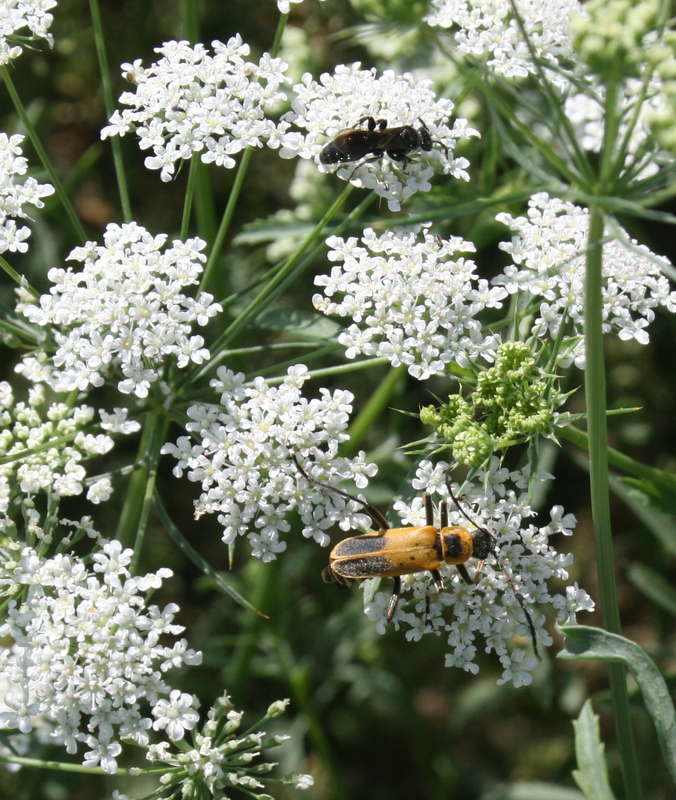 Researchers are using flowers to attract beneficial insects to the brassica field where they prey on or parasitize insect pests like caterpillars and aphids, and are studying which flowers are more attractive to the good bugs. In the next block, broccoli is grown in different types of mulch. It turns out that the choices of mulch (straw, colored plastics or paper) can make a huge difference in plant growth and also pest pressure. “Broccoli plants are not well-suited to this region, they prefer to be cooler,” says Extension’s Sue Scheufele. And this past summer, with its soaring temperatures and wet conditions, took its toll on this cool-season crop. Counterintuitively, it turned out that reflective silver plastic mulch kept the soil cool and also warded off flea beetles, maybe the most damaging and difficult to control pests of brassicas. You can find out more about this project and check back for research updates here. The very life of a bee colony depends on a clean environment within the hive. So then, how does disease find its way into a hive with subsequent transmission among and between pollinators? The answer to this key question will help researchers and beekeepers develop long-term strategies to decrease illnesses currently affecting millions of bee colonies worldwide. She and her fellow researchers are asking: does the size of bee matter? Are the kinds of flowers they pollinate a factor? How do interactions with other bee species transmit diseases across taxonomy? From the outside, it just looks like a very crowded campground. It’s more than that! To test their hypotheses, Professor Adler and post-doc Jenny Van Wyk worked out an elaborate research design to look at trait-based disease transmission. They spent the summer sorting and weighing over 4,000 Bombus impatiens (common Eastern bumble bee) and separating them into micro-colonies by size. These bees were then infected with the gut pathogen Crithidia bombi, and each tent received one colony of either small or large bees. Next, medium-sized uninfected bees were painted with a non-toxic dot for identification, put into microcolonies, and added to each tent. The goal was to see whether small or large bees differ in how much disease they spread to the average-sized bees in their tent. Tents were filled with flowers including foxglove, goldenrod and Physostegia. Every day, researchers would methodically collect data including the number of times a bee visited a particular flower and for how long. Van Wyk relays, “We can manipulate traits of the bees and flowers within each tent to be able to begin to understand how the characteristics of the meadow (are the flowers flat? are they tubular or on spikes? are the bees big or small?) to see how disease spreads in time and space.” Some flowers are better at transmitting Crithidia than others, so each set of tents uses different flower characteristics. They wanted to know whether large or small bees transmit more Crithidia, and whether the flower they are interacting with changed the outcome. Preliminary findings show that while smaller bees get higher infections, larger bees transmitted more disease, possibly because they are more active foragers and deposit more feces. Bees fly from flower to flower, leaving behind excrement onto which the next bee steps. This action spreads disease directly back to bee colonies. To document disease transmission and infections bees acquire, after a two-week observation period, bees are dissected in the laboratory to assess them for disease. Future studies include taking the study to a higher level to examine interactions with different species of bees. This two-year research grant is funded by the National Institutes of Health and includes collaboration with Cornell University, University of California at Riverside and North Carolina State University.